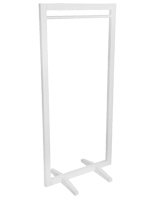 This garment rack features height adjusting, allowing you to display your garments at an ideal shopping height! 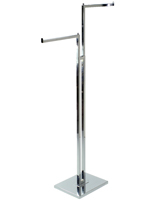 This garment rack helps to save on floor space while showcasing merchandise attractively. The display is similar to straight two-way arms but instead cascades downward at an angle. 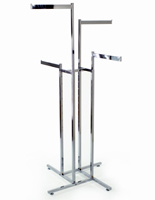 The garment rack has a professionally applied chrome plated finish which presents articles in their best light. 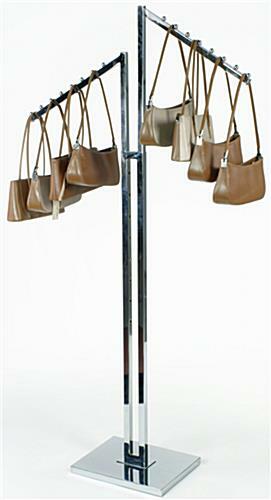 Each arm is approximately 18" long and features 8 stops for hanging clothing, handbags, or other goods. 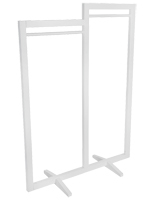 This garment rack can be used for displaying many more articles of clothing, sporting goods, and the like! You have the freedom to separate the hanged items by color, size, or style. The garment rack features 2 arms that are independent from one another. 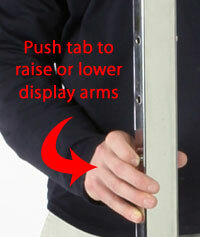 This allows you to raise or lower the arms as you see fit. 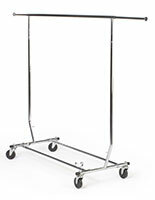 The garment rack is commonly seen at shopping centers and clothing retailers to name but a few. 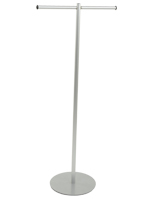 Spring-loaded buttons, located on each vertical support, push in and click into the desired hole for setting the arm. 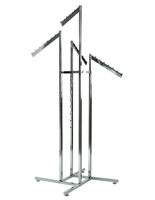 The garment rack, with its cascading waterfall design, creates a more dramatic presentation than straight horizontal styles. The fixture ships unassembled to save on shipping costs, but assembly is straightforward and quick. Height Range Min. x Max.